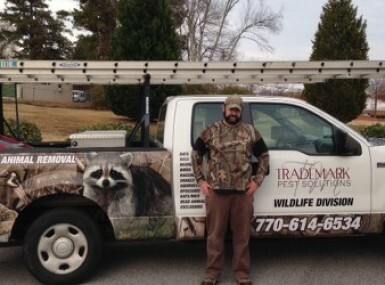 When a pest issue presents itself on your property, call the experts. We've serviced over 10,000 homes in the past decade. We'll address your issue with our 17-point inspection and remove the nuisance safely and permanently. An animal invading your home can be a danger to you and your family. We have a Nuisance Animal Control Technician, licensed by the Georgia Department of Natural Resources. Contact us today for more information. Once we remove the unwanted pest you won't have to worry about it turning around and getting right back in. Our professionals find the point of entry and seal the entryway to prevent re-entry. Here at Trademark Wildlife, we go the extra mile to make sure your home is rid of any pest you may have.